North Korea has announced today that its army had received final approval to launch “merciless” nuclear strikes against the US. 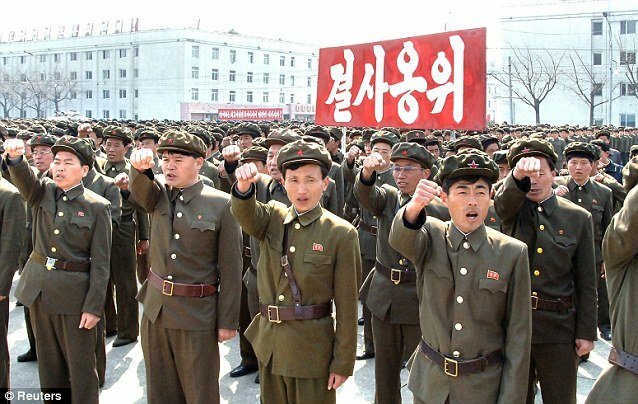 The General Staff of the Korean People’s Army said it was formally notifying Washington that US threats would be “smashed by… cutting-edge smaller, lighter and diversified nuclear strike means”, according to a statement published by the official KCNA news agency. “The merciless operation of [our] revolutionary armed forces in this regard has been finally examined and ratified. “The moment of explosion is approaching fast,” the statement read, adding that it could occur “today or tomorrow”. The North Korean move came just hours after Defense Secretary Chuck Hagel said North Korea presented a “clear and present danger” to the US and its allies after days of escalating rhetoric. Hawaii and Guam would also be outside the range of its medium-range missiles, but the US bases in South Korea and Japan may be vulnerable. Chuck Hagel issued a statement after US stealth bombers were seen patrolling the border between North Korea and South Korea as part of military exercises which have inflamed tensions in the region. Despite a successful long-range rocket launch in December, it is believed North Korea is years from developing an inter-continental ballistic missile that could strike the mainland United States, AFP reported. Chinese troops have been placed on a heightened state of alert along the country’s frontier with North Korea after a series of warlike statements and actions from the pariah state. North Korea today blocked South Korean workers from entering jointly run Kaesong Industrial Complex which is one of the few signs of positive relations between the neighboring countries. The move to bar South Koreans from going to work at the Kaesong factory zone comes a day after North Korea announced that it would re-open a nuclear facility which has been closed since 2007.